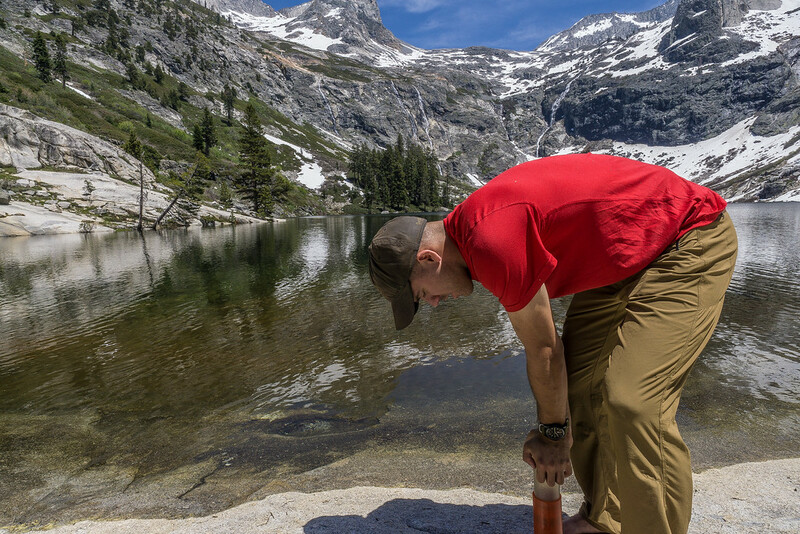 I was very fortunate that a water purifying company called GRAYL let me try out their new product for free on a week-long hike along the HIgh Sierra Trail to Mount Whitney. It was a pretty neat concept, it worked like a french coffee press but filtered literally everything out of your water. What I liked about it was it looked pretty indestructible to...I may have broken a water filter halfway through a week-long Grand Canyon Trip in the past. So me and my buddy brought it along for the trip, our sole water purification device for the two of us. It started out great, was simple and easy to use, but as the trip went on things got a little harder. The simple "coffee press" action slowly become more difficult, harder and hard each time. By the third day, I was pressing so hard to push down and filter my water that I was wearing my gloves for protection. They didn't help too much, and filtering our water was becoming my least favorite part of the trip. I ended up putting my Kabar across the top (do not attempt at home) which was extremely dangerous to squeeze out some fresh water. You can read my full review of Grayl here . Whats your outdoor gear horror story?